Around Calgary, the date April 6 carries a stigma. 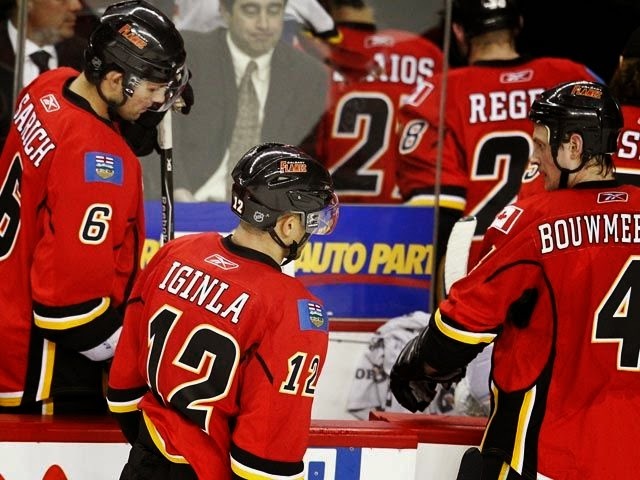 It was on this day five years ago that Calgary was officially eliminated from the 2009-10 playoff race. That ended a streak of five consecutive trips to the post-season that began with the Flames run to the Stanley Cup final in 2004. Just like today, there were six days left in the regular season in 2010 also. However, unlike today, Calgary was on the outside looking in. With three games to go, they trailed eighth place Colorado by two points in the West and were facing a must-win at home that night against San Jose. The Flames outshot San Jose 39-26, but fell behind 2-0 and only Rene Bourque in the third period could solve Evgeni Nabokov in a 2-1 loss. Combined with Colorado's 4-3 win in Vancouver that night, it was curtains on that season. Fast forward one year to April 6, 2011. Again, the Flames are barely alive in the West. This time there were five days left in the season and Calgary was 10th with two games to go. They had to pass ninth place Dallas -- even in points but holding a game in hand, then catch either Anaheim or Chicago, who were two points up. The Flames won that night, whipping Edmonton 6-1 led by a hat-trick from Jarome Iginla. However, wins by the Blackhawks and Ducks that night also eliminated the Flames from playoff contention once again. Then came the death spiral. By the time it got to six days left in the regular season the next three seasons from 2011-12 to 2013-14, the Flames were already eliminated, sitting five, nine and 13 points out respectively. For the first time in six years, the Flames enter the final week of the regular season in a playoff spot. But, unlike six years ago when they had already clinched a spot in the post-season and it was only first place in the Northwest Division they were jostling (against Vancouver) for, this year their grip on a playoff spot is tenuous at best. Los Angeles and Winnipeg trail Calgary by only one point with a game in hand. By the end of tonight, the Jets (with a win in Minnesota) and the Kings (with a win in Vancouver) could both pass Calgary, leaving the Flames back on the outside once again. The way this race has gone, you expect that to happen also. In this far-fetched yet conceivable scenario, the Canucks, Kings and Jets would all finish with 99 points. Vancouver and LA would get second and third in the Pacific, Winnipeg would get the second wildcard spot behind Minnesota. Imagine the uproar if Calgary missed the playoffs with 98 points, one year after Dallas got in with 91 points. Still playing meaningful hockey with less than a week to go is surprising. In fact, 'shocking' may be the more appropriate adjective. Despite an unexpected good start to the season, that seven-game losing (eight-game winless) streak in December looked like it would be a fatal blow. But the Flames somehow overcame that by going 15-7-0 in their next 22. The season-ending injury to Mark Giordano with a quarter of the season remaining would surely be the death punch. Wrong again, Calgary has responded by going an improbable 10-5-3 since losing their best player. With three games to go, can the Flames reel off two more wins and move 15 games above .500 for the first time since the end of the 2008-09 season? A win over Arizona on Tuesday is a must. That will then set up what would be the most important regular season game for Calgary in a long, long time in a showdown at the Saddledome on Thursday against the defending Stanley Cup champion Los Angeles Kings. That game's reign as the most important regular season game in the past couple decades may last less than 48 hours as Calgary could play what may turn out to be a winner-gets-in life-or-death game on Saturday afternoon in Winnipeg. There are a lot of subplots going on this final week. Will Sam Bennett play? His spot in the line-up would presumably be third line centre where Markus Granlund has been playing but Granlund is coming off a two-goal game on Saturday and that may have thrown the good kind of wrench into Bob Hartley's plans. Karri Ramo's unfortunate injury less than a minute into Saturday's game has thrust Jonas Hiller into the goaltending spotlight once again. The final three games will be all his with journeyman minor-leaguer Brad Thiessen serving as the back-up. There is lots of talk swirling around this team entering the final week and the encouraging part is -- contrary to what many of us believed would be the case six months ago, none of it is about draft prospects and positioning in the draft lottery. That's pretty darn impressive considering Calgary's rebuild is two years old -- if you go back to when Iginla, Alex Tanguay, Miikka Kiprusoff and Jay Bouwmeester all ended up leaving town. Up north, the Oilers are a whopping 34 points behind Calgary and are missing the playoffs for a ninth consecutive season. While the blood pressure of fans in Edmonton may be at healthier levels, I know Flames fans wouldn't want it any other way. Flames Improbable Playoff Chase Comes Down to the Wire - So close. So damn close. So tantalizingly, excruciatingly, mouth-wateringly close. With two weeks to go in the season, the Flames are right there in the playoff race, within striking distance of a playoff spot. I try to put this crazy, improbable season and all they've accomplished into some perspective. Johnny Gaudreau: Making a Case for the Best Flames Rookie Season Ever - In terms of points, Johnny Gaudreau is having the best season by a Calgary rookie in 25 years. But dig deeper and a case could be made that Gaudreau is having as good of a rookie season, and maybe even better than Joe Nieuwendyk when the Flames great scored 51 goals in 1987-88.